Eric Schmitt-Matzen has played the role of Santa Claus for years, bringing joy and laughter to children at Christmas. But after granting a terminally ill boy a wish at a hospital recently Schmitt-Matzen could not go “Ho Ho Ho”. A hospital had called informing him a very sick boy wanted to see him and he agreed to be there for him. There, the professionally trained Santa could not summon the signature laughter or exude joy as he has for so many years. 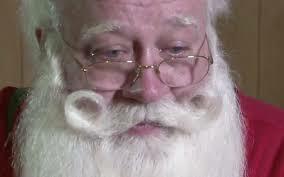 Santa Claus was reduced to tears. Schmitt-Matzen told Sam Venable of the Knoxville News Sentinel, “I cried all the way home. I was crying so hard, I had a tough time seeing good enough to drive. Venable said Schmitt-Matzen got to the hospital in 15 minutes after receiving the call and met the boy’s mother and relatives. He quoted Shmitt-Matzen as saying, “When I walked in, he was laying there, so weak it looked like he was ready to fall asleep. I sat down on his bed and asked, ‘Say, what’s this I hear about you’re gonna miss Christmas? There’s no way you can miss Christmas! Why, you’re my Number One elf!